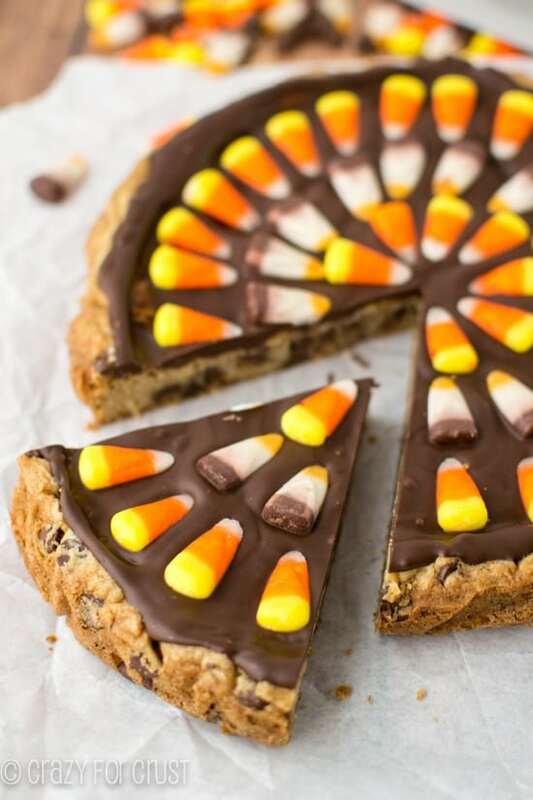 Perfect for Halloween or Thanksgiving, this Harvest Chocolate Chip Cookie Cake is so easy to make! I’ll never forget when I was a kid, we’d walk through the mall and I would beg my mom to stop at Mrs. Field’s. Her cookies were (still are) sooooo good. I’d be drooling for one as soon as we hit the parking lot. One of the things I remember most about the Mrs. Field’s stores were the cookie cakes. They always had several on display for whatever holiday was coming up next. Hearts for Valentine’s, ties for Father’s Day, etc. Those cakes wowed me. I mean…it’s a cookie. But it’s a cake. And, as much as I love Mrs. Field’s…it’s so much easier (and cheaper!) 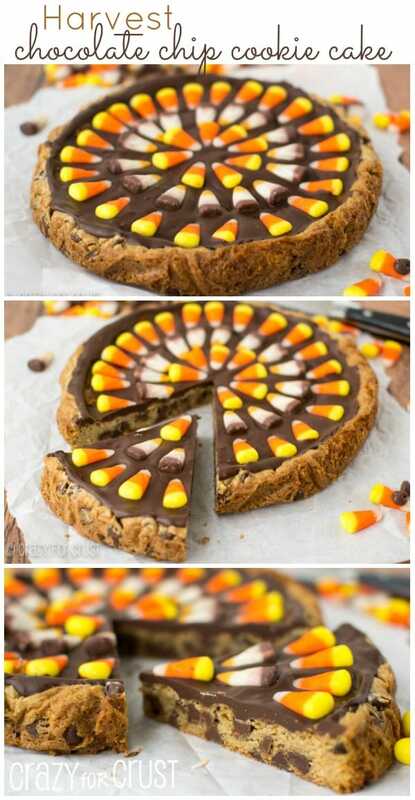 to make your own cookie cakes at home! Now, as a baking blogger, I get asked all the time if I sell my baked goods. I usually shake my head no, and point people in the direction of Mrs. Field’s, or some other similar establishment. I mean, who needs the stress of baking for sales? I’ve done it a few times and it just is usually too much for my psyche to handle. Plus, it’s sort of illegal here in California, if you’re doing it from home. But occasionally a friend will need a cake for a party. Or cookies for something. And of course, for friends, I can’t say no. Needless to say, I needed to test my cookie cake recipe. I wanted to make sure my idea worked perfectly, and in the interest of sharing pretty much whatever comes out of my kitchen, this Harvest Chocolate Chip Cookie Cake was born! 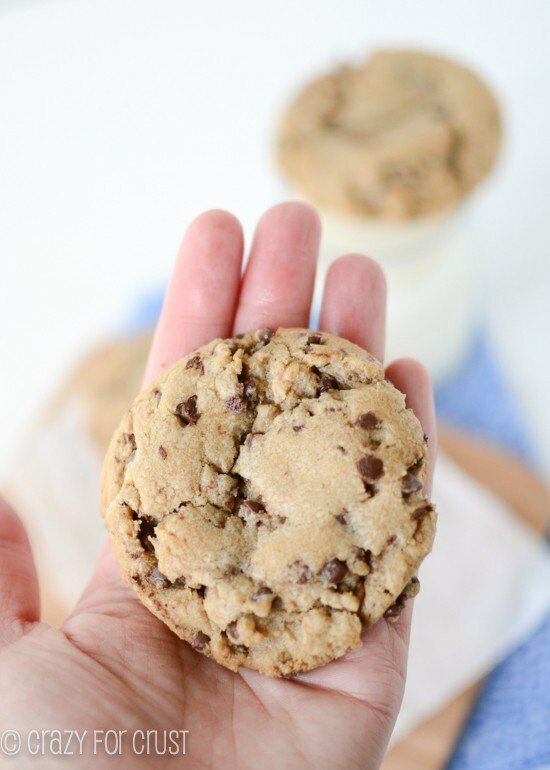 The cookie recipe is based off of my bakery-style chocolate chip cookies. I cut down the recipe to fit in a 9″ round cake pan, and I used melted butter instead of browned. It’s just as fabulous as the original, if I do say so myself. Special note: you still need to chill the dough. Because the butter starts of melted, everything is hot. Even though you are pressing it into a pan and don’t have to worry about spreading, you still need to chill it, or it will be a hot mess. You don’t have to do it overnight, just an hour or two. Easy-peasey. 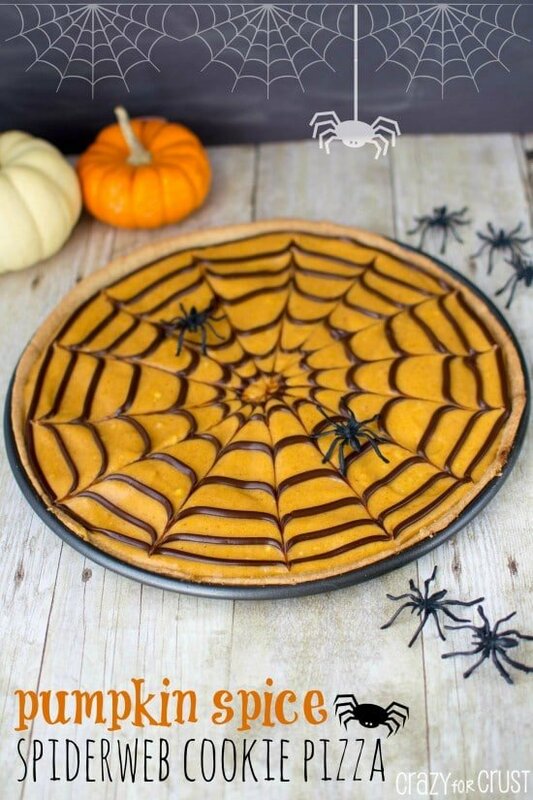 Once it cools, you can frost or decorate it as you like. Now, I know that traditional cookie cakes have buttercream. But I’m using melted chocolate on all those footballs, so I wanted to try it out. And pretty much, guess what? So, once it cools, you melt some chocolate with a wee bit of shortening. This helps it melt smoother, and helps it not firm up so much when you’re cutting it later. 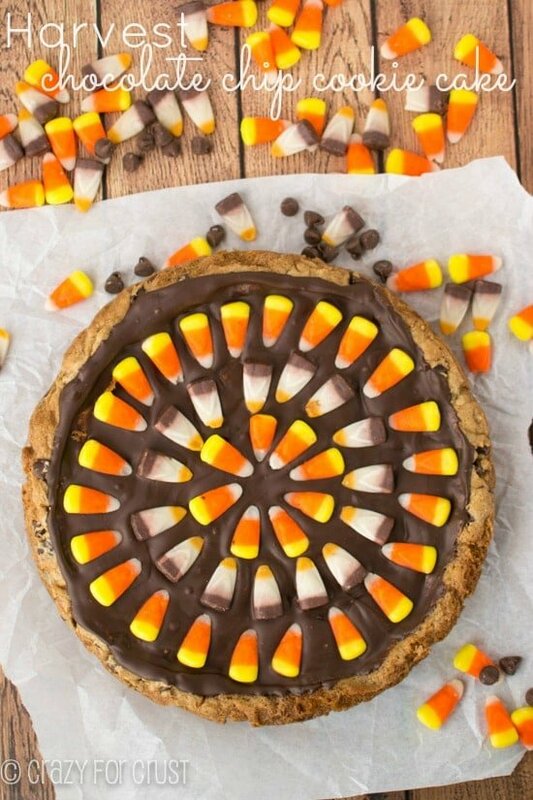 Frost the cookie cake with the chocolate. While it’s still hot and melted, that’s when you add the candy corn. Did you know they make different flavors of candy corn? Traditional, caramel, and s’mores. 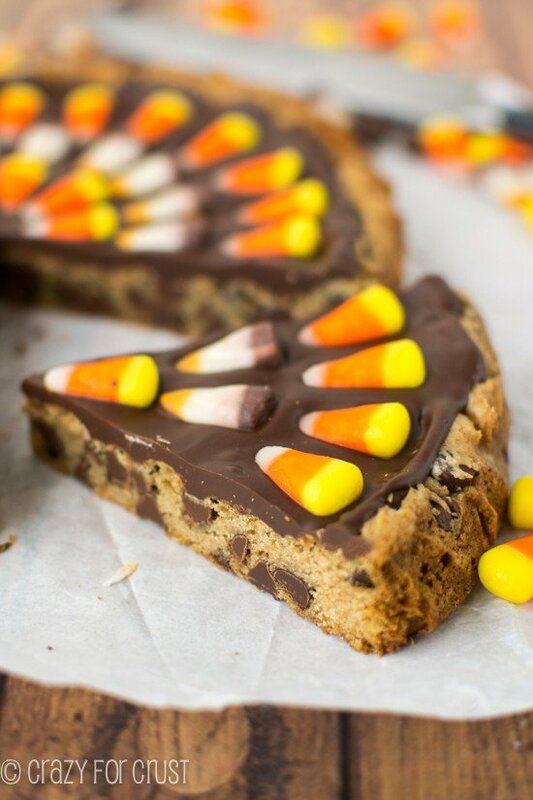 YES – they make s’more candy corn! It’s so good. Anyway, stock up on some candy corn. Then decorate this harvest cookie cake. I made a sundburst pattern out of the candy corn. 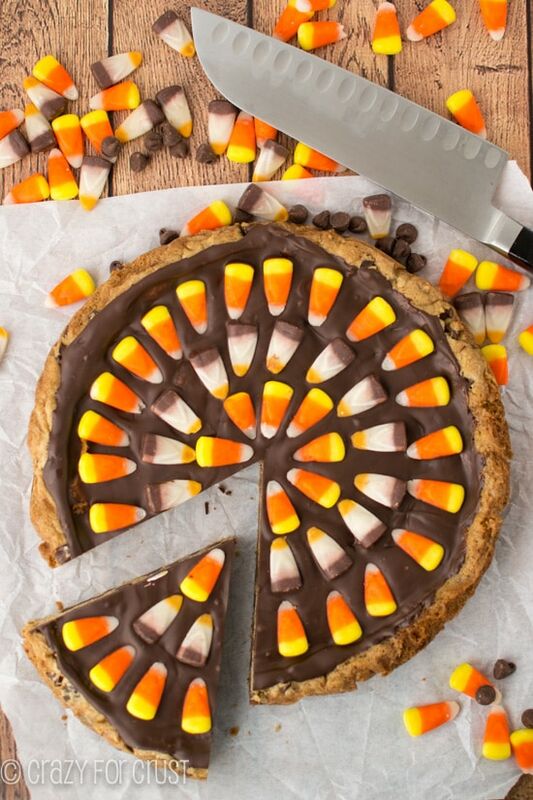 I think it would be a perfect Halloween treat, but this would also work for Thanksgiving. It kind of looks like a turkey, right? And the colors are very thanksgiving-y. The kids can do this for you, even. And then they can eat it for dessert and you don’t have to listen to them complain they hate apple and pumpkin pie. If I do say so, I think this is the best cookie cake I’ve ever eaten. And now I’m totally ready for some football. Line a 9” round cake pan with foil and spray with cooking spray. Pour melted butter into an electric mixer fitted with paddle attachment. While still hot, add both sugars and mix on low until combined. Let sit to cool for a few minutes. Turn mixer (with butter mixture bowl attached) on low. Add egg and mix completely. Mix in vanilla extract. Add baking soda, salt, and flour and mix until combined. Stir in 1 1/4 cups chocolate chips. Press into prepared pan. Chill for 1-2 hours. Preheat oven to 350°. Bake for about 20 minutes. The top will start to get golden, but it will still look a bit jiggly in the center. Cool completely. When ready to top, melt remaining 1 cup chocolate chips with shortening (about 45-60 seconds in the microwave). Spread over the top of the cookie. Add candy corn in desired pattern. Chill to set. Tonight is our cooking lesson and Delaney wanted to do a cookie cake. 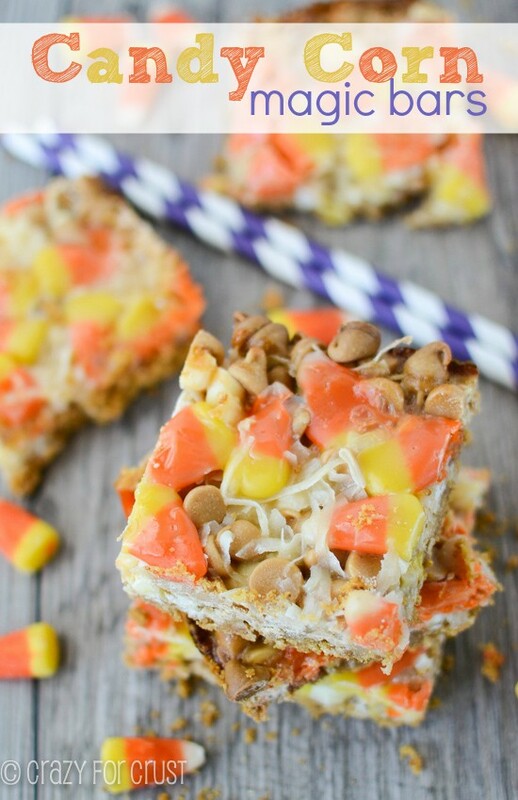 While I was at the store, I picked up candy corn and frosting and figured I would find a recipe when I got home! So, we are making a very similar cookie cake, but I am using your base recipe. Can’t wait to try it out!! !